With Easter right around the corner, we only have one thing on our minds here in the Vanity Van HQ and that’s Easter Chocolate! If you’re looking for a way to indulge this Easter without consuming a ton of calories we have discovered some luxury chocolate treats and Easter chocolate beauty trends to tickle your taste-buds. Our lips are still suffering the effects of winter, and are looking a little parched. Here’s a super quick and easy recipe for a homemade scrub to banish the chapped lips, just in time to make the most of spring lippie shades! 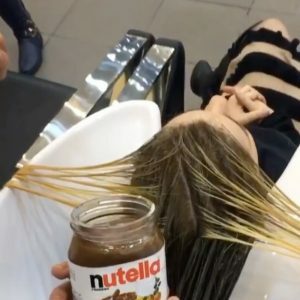 So, unless you’ve been living under a rock, you’re probably aware of a certain well known chocolate spread going viral after a video emerged of it being used as a hair-dye by a hairdresser in Dubai. Obviously, we had to check it out, and it turns out that Nutella truly CAN be used to tint light blonde hair temporarily. If you are after a hazelnut hue (pun intended) to calm a brassy blonde, then this mixture of Nutella and condensed milk, may be for you. However, whilst the oils in Nutella are certainly beneficial to hair, one must wonder if it is worth the hassle and the wastage of a perfectly good snack! We remain undecided on this one! 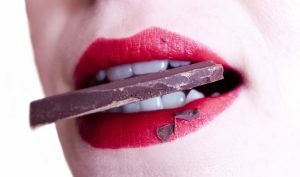 We all love to eat it but what about putting chocolate on your skin? I don’t know about you but our team were a little dubious. 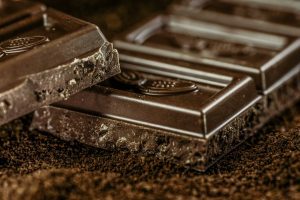 However, research has shown that flavonoids found in dark chocolate absorb UV light, help improve blood flow to the skin, and improve the skins hydration and complexion! Home made chocolate face masks are very easy to make just create a paste with 2-3 tablespoons of dark cocoa powder and 2-3 tablespoons of natural yoghurt. The yoghurt contains lactic acid to help unclog pores. Apply this to your face with clean fingertips and let it sit for 10-15 mins before washing off. Top Tip: for extra hydration, try adding a spoonful of mashed avocado to your mix! As if we needed any further excuse to slather ourselves in chocolate, head to toe!